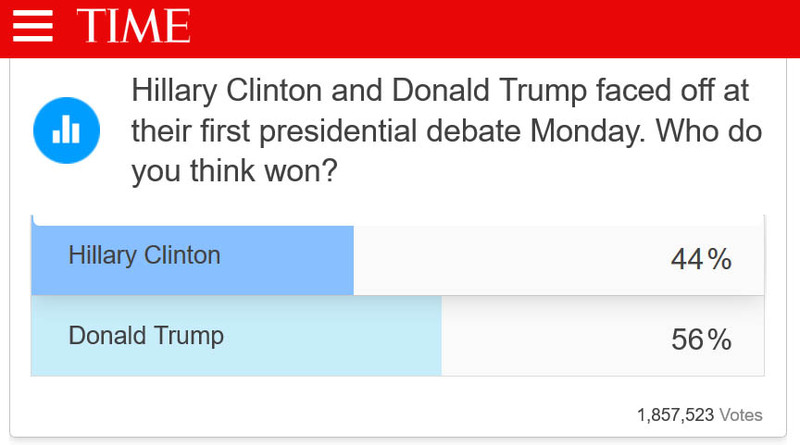 Time Magazine debate poll results. The race towards the presidential elections 2016 is heating up. 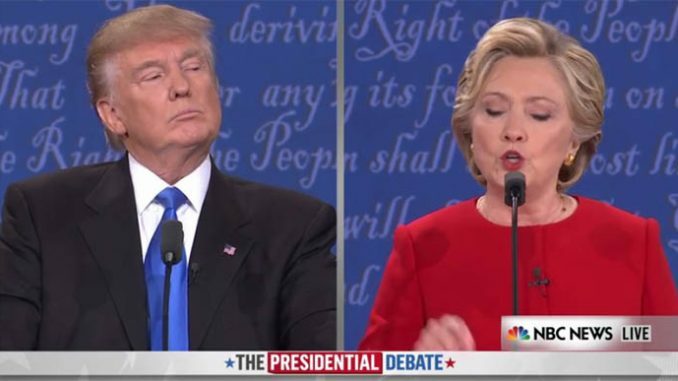 Hilary Clinton and Donald Trump locked horns last night with an anticipated viewership the size of the Super Bowl for the first Presidential debate. Clinton is focused on pushing financial growth and an economically viable America while Trump’s agenda has been on the safety of the country in various aspects. Whether if it safety against crime, safety against misuse of taxes, safety from countries like China and Mexico, Trump is focused on his safety agenda. After the debate, different channels and websites ran their polls. Some had their correspondents located at various universities, some had them in studio, but everyone showed different results. 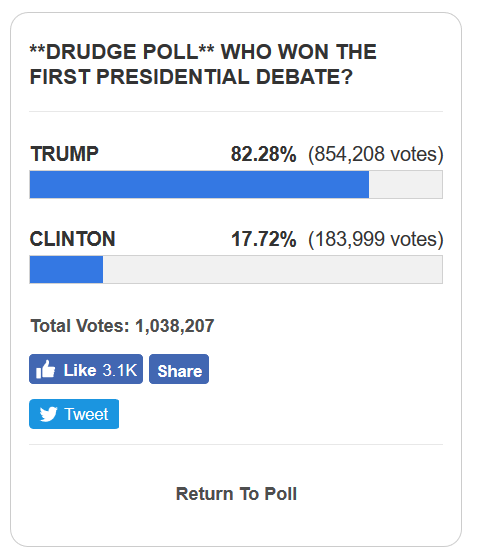 For example look at the above DrudgeReport poll about who won the debate. These were not countrywide polls or federal polls but were mainly done on a small sample of people. CNN for example, had the opposite results of Drudge Report saying that Hillary Clinton dominated the debate. 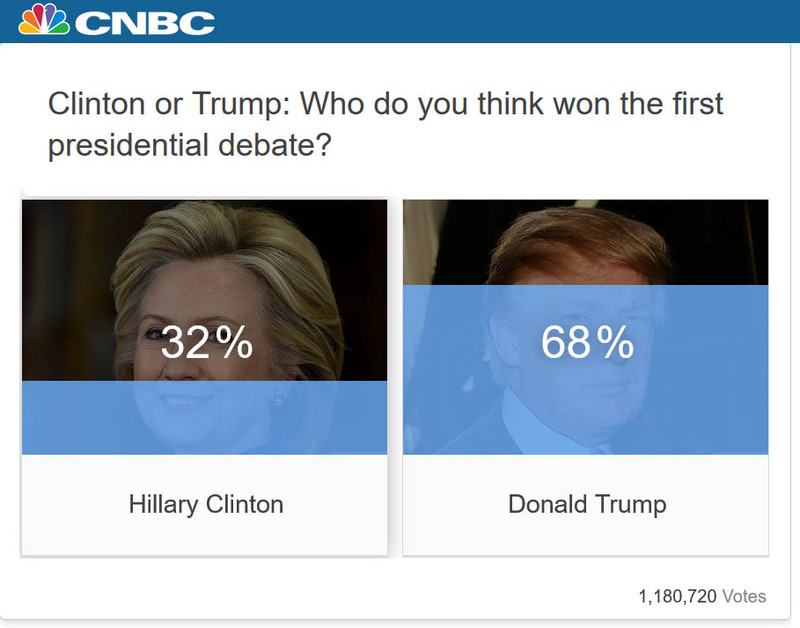 Overall it is presumed that Hillary Clinton won the first debate. There are also polls in favor of Trump making it close or tied with Clinton but largely polls declared Clinton an outright winner. CNN’s poll results from Hofstra University in New York where there was a group of people watching the debate. The group contained more Democrat supporters (41%) as compared to only 26% Republican supporters and voters. But the poll conducted after the debate came heavily in favor of Clinton. 62% of the people thought Clinton won the debate fair and square while 27% thought Trump was the clear winner. Even though there were more Democrat supporters in the crowd but what was worth noting is that the 33% of the undecided voters mostly voted for Clinton. Historically it has been witnessed that the undecided voters are the one that swing the pendulum in the favor of one candidate or the other. Aside from the frequent bashing from Trump to Clinton and Clinton to Trump, the debate mainly revolved around four issues – jobs, taxes, birthers, and crime. It is considered by various stats, polls, and experts that the first half of the debate which is the most watched part of the masses, was won by Trump. He did extremely well in the first half but Clinton came back strongly in the second. On the topic of jobs, Trump was skeptical of the fact that the current government, which majority Democrats, has not done enough to stop the jobs from going to China and Mexico. He argued that the bilateral agreements and deals such as North America Free Trade Agreement (NAFTA) that were agreed with other countries has been detrimental for the country. Trump repeatedly claimed that this was the worst deal the USA has ever signed and it was put into law by Hillary Clinton’s husband Bill Clinton. NAFTA has allowed American-based companies to shift their manufacturing facilities to either China or Mexico which is why the “jobs are fleeing our country”, Trump said. Clinton did not have a good counter argument on this matter. The second topic was taxes. Clinton bashed Trump for not releasing his taxes and insinuating that maybe he does not pay federal taxes which indirectly means he is not helping the country in supporting veterans, healthcare, schools, etc. Trump replied, deliberately or unintentionally by saying “I am smart” for not paying taxes which may not have come across well with the masses. Trump added that he would reduce the tax rates from 35% to 15% for companies of all sizes. Clinton called Trump’s plans as “trickle-down economics” and said that her plan is to benefit all not just the rich. She added that the country needs to be financially strong and economically healthy and reducing taxes would not help achieve that goal. The third topic was birther claims which means that a certain person is not a US national therefore does not have the right to be the President. Trump has claimed that America’s first black president Barack Obama was not an American, therefore, his appointment was wrong. This argument was exaggerated by Clinton who made sure it was known that she feels Trump is a racist. To call Trump racist was a step too far and a clear reach by clinton. However the racial or religious minorities in the US are not pleased by Trump’s view on birtherism so Clinton wanted to add to the fire by calling Trump racist. Lastly, the topic of Stop and Frisk was raised along with the Iraq War. Clinton blamed Trump for supporting the Iraq war which he completely denied. This portion of the debate was a mess which included endless interruptions and messy conversations that included Lester Holt trying to clean it up. Clinton also debated that the “Stop and Frisk” was unconstitutional and abolishing it has helped in decreasing racial profiling. Trump completely opposed the argument by saying that the Stop and Frisk was the best way to decrease crime in places like chicago. Trump added that Stop and Frisk worked in New York City to take murders from 2000 down to 500 per year after it’s implementation. Another important topic was the idea to take guns away from people who should not possess them. Both candidates agreed that this should be the case. After the show, CNN’s liberal view showed that in a total of almost 700,000 Stop and Frisks by the law enforcing agencies, only 0.2% people had guns. This again went against Trump’s argument. We are working on fact-checking more into this topic. As we look at the debate as a whole in terms of best presentation and making the most concise points, it appears that Hillary Clinton came out the winner. I’m sure the drama is far from over as there are two more presidential debates and one Vice Presidential debate still to come.